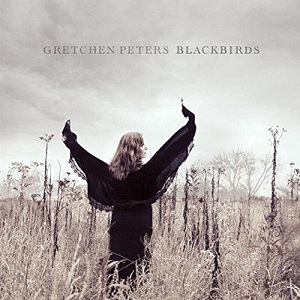 "Blackbirds" is the tenth album from American Grammy nominated singer/songwriter Gretchen Peters. Her songs have been performed by artists including Etta James and Neil Diamond. She was recently inducted into the Nashville hall of fame. Gretchen Peters sings what is probably best described as a mix of Country and Folk music, although on this album there's quite a dark feel to it. Her songs are simply arranged leaving her voice and the beautiful lyrics she writes as the main focus. In this way, all the emotion in the songs comes through clearly. For this album she has chosen to sing about aging and mortality, a subject rarely tackled by female songwriters. It's a subject area that seems perfectly suited for Gretchen Peters given how much emotion there is in her voice. The songs tell stories based in various locations including Louisiana, where title track "Blackbirds" is set at the scene of a crime, and the Gulf of Mexico where a fisherman lays his wife to rest after losing everything after the BP oil spill, and one song is set in her adopted hometown of Nashville. What I love most about Gretchen Peters is the songwriting - the songs all tell stories superbly well, and that paired with her wonderfully emotive voice and the music means the songs are a real pleasure to listen to and you find yourself drawn to the stories being told. There's so much detail in the songs as well as the emotion, and that is part of what makes the stories so compelling. This is a superb album and is highly recommended.